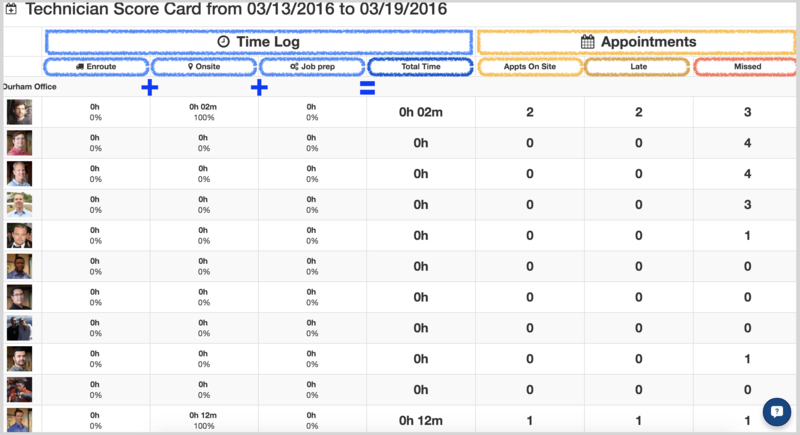 ServiceTrade's Tech Scorecard is a useful tool for gathering at-a-glance information on your tech activity -- given a specific timeframe. In order to use the Tech Scorecard most effectively, it is obviously important to understand the rules that drive what information appears in the Tech Scorecard for your designated date range (as well as how these rules may differ from your expectations). So with this goal of "behavioral understanding" in mind, this article will provide a comprehensive overview of the Tech Scorecard. Additionally, it will cover what conditions are required for an event to appear in a certain place on the scorecard page, as well as some common sources of confusion that can either make the scorecard seem inaccurate, as well as some things that can actually make the scorecard information inaccurate. The image above shows how to access the Tech Scorecard within ServiceTrade. The Tech Scorecard sits in the sub-menu, under "Jobs". First, hover your cursor over the "Jobs" button on the main menu, then click "Tech Scorecard" in the sub-menu that appears when you hover over "Jobs". Your Tech Scorecard will look something like the image below (minus the colorful annotations). If you are using ServiceTrade correctly, there will be significantly fewer zeroes on the left-side (and hopefully more zeroes on the right-side). The next few sections will cover how to use the Scorecard, and what to information you should expect to see when you specify your date-range of interest. See the animated graphic image file below, which illustrates how you can set your target date range, beginning by clicking on the small calendar icon at the top-left of the page (just to the left of the "Technician Scorecard..." title).